Theory of mind (ToM) is defined as ability to understand mental states of others. ToM has been hypothesised to be a universal ability. However, several cross-cultural studies that examined non Anglo-American children found some variations in the onset time of ToM. Likewise, several recent brain imaging studies found variations in brain regions that are involved in ToM. These results suggest that ToM and its neural basis are not entirely universal and that there are some significant cultural / linguistic influences in the ToM development. 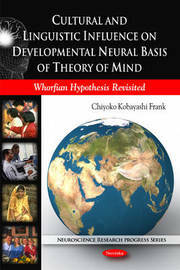 In this book results of behavioural and neuroimaging studies that examined ToM and related social cognition are selectively reviewed. More specifically, the author discusses the roles of the medial prefrontal cortex and temporo-parietal junction that have been implicated in ToM and distinguishing "self" from "others". These structures may be particularly important for culture-dependent ways of ToM understanding. Theoretically, these results may support the Sapir-Whorf hypothesis: the person's language / culture sculpts his / her thoughts and cognition.